Picture frames hold some of our most cherished memories. They are also the staple of what make our homes feel, well, like homes. Indeed, picture frames bring a lot of joy to our spaces, which means that we all want them looking their best. 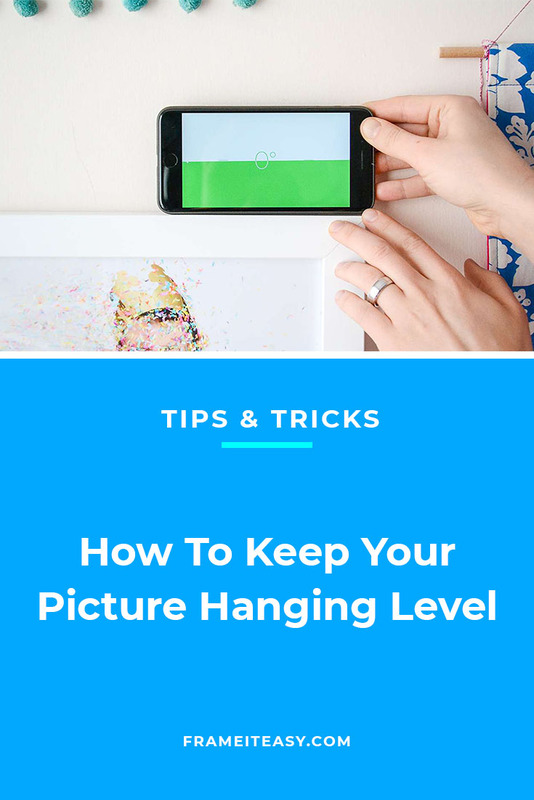 Part of this is keeping your picture hanging level at all times. We’ve all walked by a picture frame and felt the need to adjust it when it’s looking a bit crooked. You should do this task as little as possible though, right? Sure, some adjustments might need to be made from time to time (things can get knocked around in your home, especially if you have kids), but knowing a few key tips will make you a level frame master. If you’re concerned about the frame being level before even placing it on your wall, try using Painter’s Tape for a clean way to mark where to hang your frame. You can get some from your local arts and crafts or hardware store. No need to worry about it damaging your wall, either — it can be removed without leaving marks or adhesive residue. Place a piece of Painter’s Tape on your wall, and make sure it’s as straight as possible. Once you do this, draw a line along that tape for reference, and then place your hook & nail or wall buddies along that line. 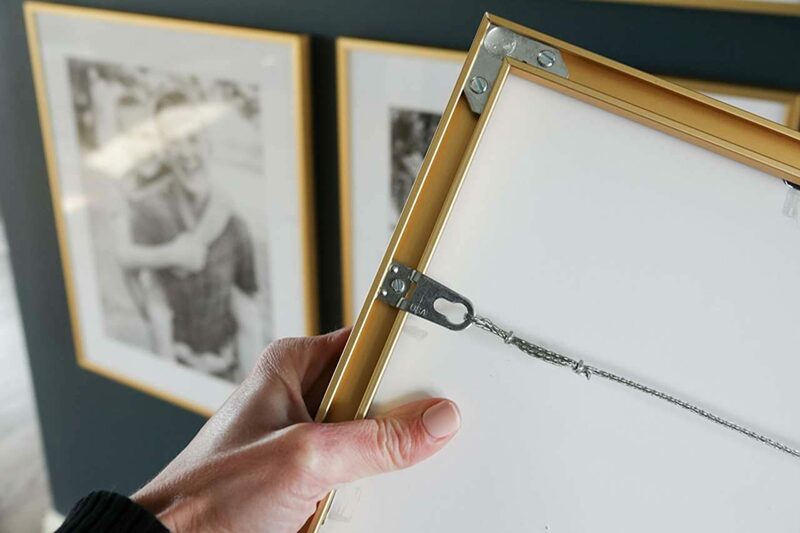 This could be a good way to pre-plan your frame’s position, and it’s a good step to make sure your frame will be level in comparison to your other wall decor. Also, this measure can be taken before even framing your art, so you will know exactly the size and placement ahead of time. If you are working with a limited amount of space, it could also be a good way to see if your ideas would fit. It’s better to be sure than to have some part of your display bumping into something else. If you would like to make sure the leveling is perfect, one of the best picture hanging tools you can use is a standard bubble level. (You know, those handy tubular vials that have a bubble that rises to the center.) Because our eyes can think an object is straight when it may not be, having a level on-hand is a huge help. Some levels are simple, offering only a single direction of orientation. Others might be more complex, having horizontal, vertical, and even diagonal directions. You should be able to get by with a level that only has one direction, but you pick what works best for you. In fact, if you have a smartphone, you may already have a suitable level ready to go. If you have an iPhone with the latest iOS installation, you can use the “Measure” app and get an exact reading in degrees to align your frames. And if your phone doesn’t have built in levels, there are plenty of free apps to download and try. Save a trip to the hardware store and do it right from your pocket! Use the level of your choice to get the angle right and painter’s tape to mark spots onto for reference. This should allow you to make sure everything will be straight and looking great after you secure your hanging hardware to the wall. Another key thing to check is to make sure you have the correct hanging hardware when hanging your frame. It’s one of the most important steps, regardless if you took the precaution of laying down painters tape in advance. 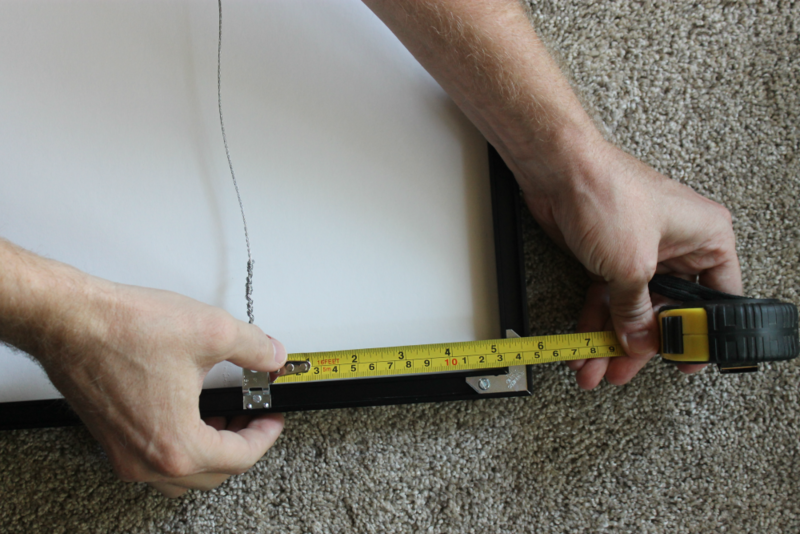 Here at Frame It Easy, we use hooks and wires to hang frames — along with the correct rings to hold the wire in place. 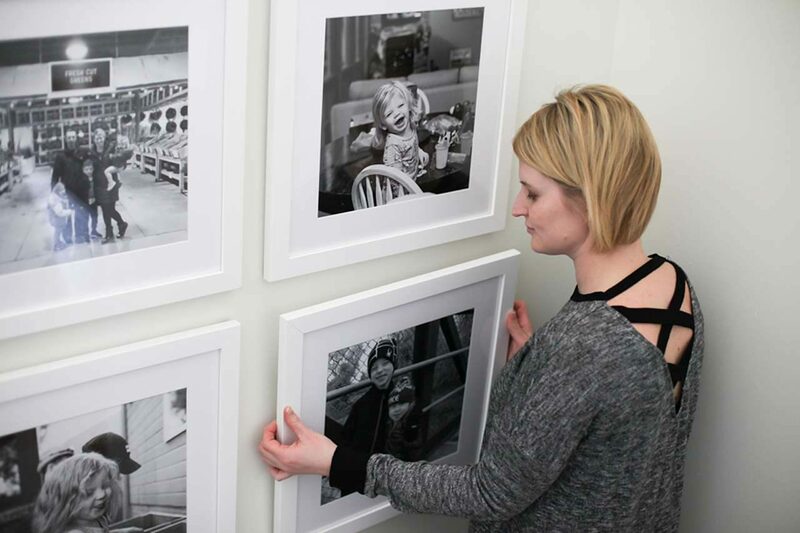 We ship everything you would need to hang and display your frame in a satisfactory manner. Also, for larger metal frames, we include an extra wire that goes diagonally across the back of the frame. Similarly, we would use mounting brackets and wall buddies for larger wood frames. These are both meant to keep the frames laying flat. If they weren’t present, they would start warping and bowing, causing an uneven display. If you receive a certain set of hanging hardware with your frame, be sure to use that set. Framing companies often test their frames with the set of hardware that they send you, so adjusting or making your own custom set could lead to some unforeseen issues — and there’s no need complicate anything. That said, every company is different — when in doubt you should check with the framer you’re purchasing from to ensure you have the correct equipment. Once you confirm you have the right hardware, next you would want to make sure that the hanging hardware is on the upper part of the frame. Not dead center, and not too low. If it’s either of the latter, the frame would flop over and/or appear top heavy. This would leave an acute angle gap between your wall and the frame — not cool. If the rings holding the wire on your frame are installed at the correct position, though, you should be fine. It’s helpful to get this right the first time — since some hanging hardware requires a screwdriver to remove and reinstall, a few extra minutes of thoroughness can save you extra trouble down the road. The hook and nail— the other half of hanging your frame— are just as important as the brackets and wire. The hook is the fulcrum off which your wire — and the rest of the frame by proxy — will hang. If you position the frame in such a way that your hook is too far to the left, it will appear lopsided in that direction. The inverse is true for the right side. Hence, it’s important that your hook be as centered as possible along the wire of your frame. If the frame is leaning too far in one direction, scoot it over to the opposite side. Go back and forth enough, and you will find the perfect position on the hook for your frame. The wire should slide easily along the hook, so you shouldn’t have trouble adjusting it. Once again, you can also use a level to make sure the frame is picture perfect. If centering your hook is difficult, you can always try using two hooks for one frame. For this, you would put two hooks behind your frame— equal distance from one another. Then, you would drape your wire across both of them. One hook is typically enough to hang your frame and keep it level, but two would provide that little extra security. It would also prevent the wire from becoming unbalanced over the one hook. Here at Frame It Easy, we always include one hook and nail with your order. If you need extra, let us know and we can see how we can best accommodate you. Nothing is ever perfect, unfortunately. And in a house where things could get knocked around, you might have to keep a keen eye out to make sure everything stays even. It’s why you should do a quick pass by the frames every so often — at an adequate distance — to see how they’re hanging. If they’re a bit off, use a ruler to set them back into place. Just set your ruler flat underneath the frame, and see if the ruler draws a straight line from one side to the other. 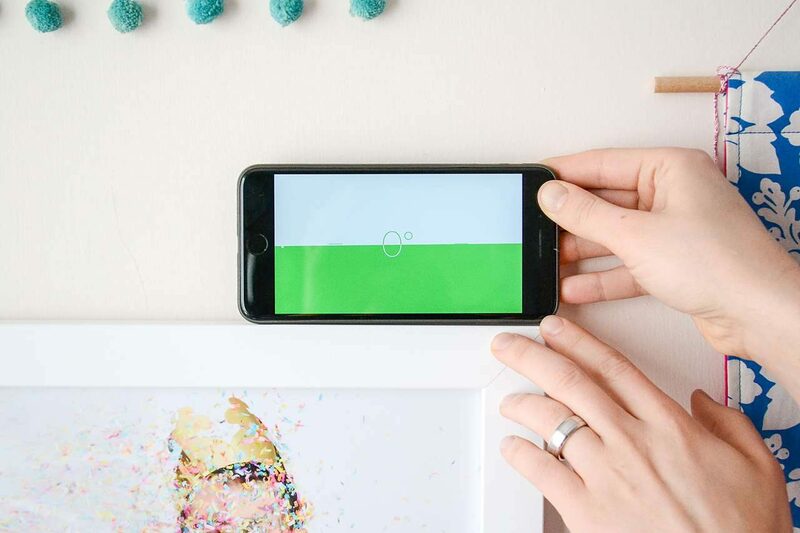 Or, as mentioned before, you can pull out your phone and use a level app to get a perfectly-measured angle for your frames. It shouldn’t take more than a few minutes to do, and will ensure things are kept in tip-top shape. Hanging your frame should be the final piece of your project. You’ve already measured your art, ordered the frame, and placed your artwork inside. With clear instructions that should come with your frame, the task of hanging shouldn’t be too hard. Once it’s on the wall, you get to sit back and admire a framing job well done. Some light maintenance might be required, but constantly adjusting it to make sure it’s level shouldn’t be among them. To recap, here are some key takeaways to ensure your frame is level upon hanging — and that it stays level. Use painters tape as a preliminary measure. Using a level can definitely help. If you’re installing the hanging hardware yourself, make sure it’s on the upper part of the back of the frame. Always make sure you have the correct hanging hardware. Keep the hook as centered as possible along the wire of the frame. Try using two hooks, if all else fails. Keep an eye on your frames and adjust them from time to time when necessary.